Hydraulic fracturing risks reactivating geological faults and thereby causing small to moderate earthquakes. Regulators can respond to this risk by imposing 'traffic light schemes', in which fracking programs must be amended or shut down if events larger than a given magnitude are induced. Some sites may be monitored with dense networks of instruments, capable of detecting tiny seismic events. However, such monitoring arrangements are not always logistically or economically feasible. The challenge we address in this paper is to maximise the detection thresholds of such small, sparse, surface networks so that they are capable of identifying small-magnitude events. 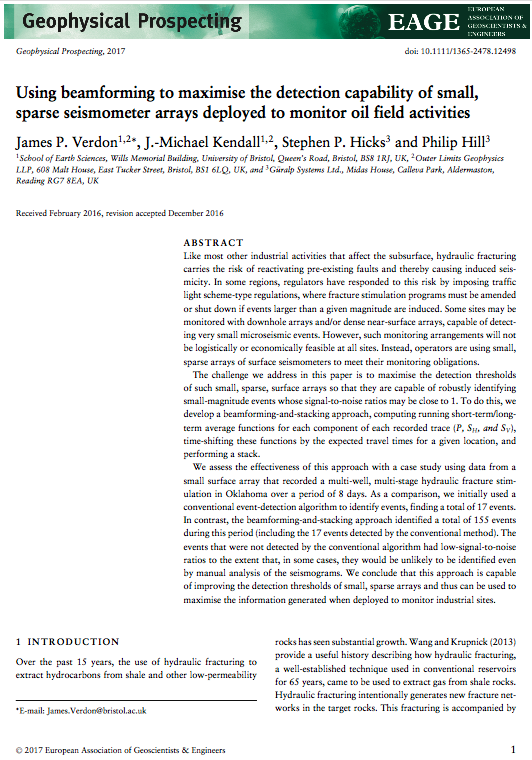 We assess the effectiveness of this approach with a case study using data from a multi-stage hydraulic fracture stimulation in Oklahoma. We conclude that this approach is capable of improving the detection thresholds of small, sparse arrays and can be used to maximise the information generated when deployed to monitor industrial sites. 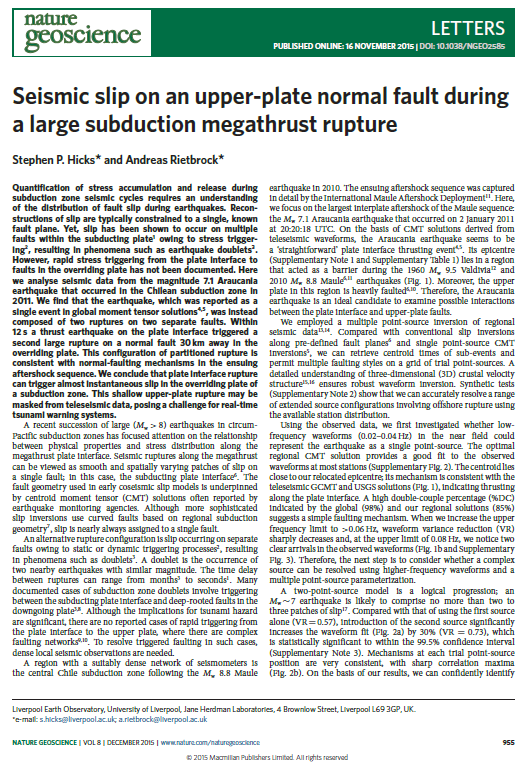 2015 | Hicks, S.P., Rietbrock, A.
Quantification of stress build-up and release during subduction zone earthquakes cycles requires a detailed understanding of the distribution of fault slip during ruptures. However, rapid stress triggering from the plate interface to faults in the overriding plate has not been previously documented. Here we analyse seismic data from the magnitude 7.1 Araucania earthquake that occurred in the Chilean subduction zone in 2011. 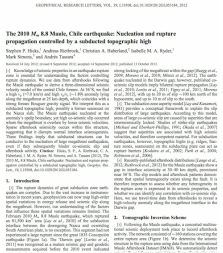 We find that the earthquake, which was reported as a single event in global moment tensor solutions, was instead composed of two ruptures on two separate faults. Within 12 s a thrust earthquake on the plate interface triggered a second large rupture on a normal fault 30 km away in the overriding plate. 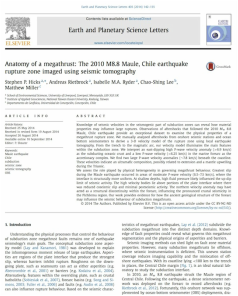 We conclude that plate interface rupture can trigger almost instantaneous slip in the overriding plate of a subduction zone. This shallow upper-plate rupture may be masked from teleseismic data, posing a challenge for real-time tsunami warning systems. A high resolution 3D image of one of the world's most earthquake-prone regions reveals that several dense geological anomalies lie along the geological fault. By comparing these images with the way the earthquake ruptured, we show that dense blocks of ancient mantle may have caused the rupture to slow down along the deeper portion of the fault. Our work shows how ancient geological structures may affect present-day earthquake ruptures. Such work may shed light on how similar earthquakes in other regions may behave in the future. A preliminary model showing the internal structure of a rupture zone in the aftermath of one of the world's most damaging earthquakes. This work shows a possible subducted underwater mountain may have initiated the earthquake. To generate this model, we measured smaller earthquakes on a network of sensitive instruments, seismometers, that were deployed by a international consortium of universities and research institutions. By measuring the speed of seismic waves travelling the Earth, we show how the sinking of a giant tectonic plate - part of the Pacific Ocean - beneath South America causes the underlying hot mantle to be dragged down with it. Very few other subduction zones show this characteristic. 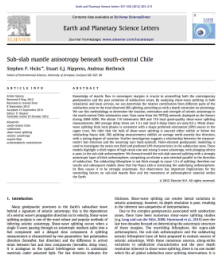 The ability of the mantle to be dragged down with the subducting plate may have important implications for how subduction zones - one of planet Earth's most important processes.